More and more households are integrating smart technologies in almost every corner of their homes. And since we’re already talking about smart doors that allow access only to predetermined folks, why not use the same principle to allow only dogs with access through the door? This is the basic premise of today’s electronic dog doors and we’re here to share with you the best in the market. PetSafe’s Electronic SmartDoor Automatic Dog Door is an easy-to-install option if you want fully automated access for your pooch. The package already comes complete with everything you need. The SmartDoor already comes with the SmartKey pet tag giving your pet exclusive access to this entry and exit portal. It comes with fully programmable functions such as selective entry and exit as well as fully automatic locking functionality. The good thing with the SmartDoor is that only pets with the SmartKey will be able to pass through. It can be installed on any door regardless of thickness as long as you purchase tunnel extensions in cases where your door is unusually thick. It is battery-operated, too, so there’s no worrying about increasing your electric consumption. The SmartDoor is also available as a wall installation kit, just in case you don’t want to put in in your door. 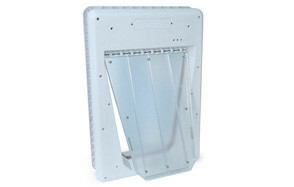 If you can forget its hefty price tag, then the PlexiDor Wall Mount PDE Electronic Pet Door is an exceptional buy. This automatic pet door also uses RFID technology to allow access only to pets that wear the RFID signature that the PlexiDor is programmed with. It already comes with a sensor key that easily attaches to your pet’s collar. The PlexiDor can be programmed to remain open for a certain period of time. The only downside, aside from the fact that it is prized exceptionally high, is that the PlexiDor needs to be plugged or hardwired to your home’s electrical circuit, unlike other brands that are battery operated. Nevertheless, it already comes with an aluminum tunnel that will communicate the interior frame with the exterior. And with a 5 year warranty plus very positive feedback from dog owners especially with its secure features, the PlexiDor secure dog door is definitely a great investment. With 10 different sizes to choose from, the Solo Automatic Electronic Dog Door can be an amazing choice. It is priced lower than PlexiDor but is still more expensive than the other products in this list. A Solo large dog door will help you keep your pooch where you want it to without you having to open and close the door for it every time. Unlike other pet door products, however, Solo operates with a magnetic pet tag mechanism, eliminating the need for batteries. Additionally, door closing is gravity-dependent, slowed down by a unique mechanism that should remind you of hydraulic door closers. Again, if you don’t mind paying several hundred dollars for a pet door, then Solo just might be the answer. High Tech Pet’s Power Pet is an ultrasonic-activated automatic dog door, unlike the conventional RFID-activated systems. The ultrasonic mechanism is fully directional so it will only be activated if your dog is in the direct path of the signal. This is a unique feature since it prevents the inadvertent activation of the Power Pet if your dog happens to be anywhere near the High Tech. Power Pet also comes with 4 different access controls so you can decide how the secure dog door will behave at any given time. It may be priced higher than the PetSafe SmartDoor, but it is still a lot cheaper than the PlexiDor and Solo. At the very least, you’ve got an excellent option if you want a fully automated access mechanism for your pooch. There are many reasons why a lot of folks look at the Sure Pet Care SureFlap Microchip Pet Door system as simply the best. First, it is the least expensive among the various automatic pet door products in this list. Secondly, it is fully compatible with various microchip formats all over the world; you will simply have to program the SureFlap to recognize the microchip signature. What’s more, it can store up to 32 different microchip signatures making it perfect for kennels or multi-pet households. You’d have to purchase the SureFlap microchip tag for each of your pets, however. Technically, even if you purchase another pet tag brand, SureFlap will recognize it. It also comes with a Curfew Mode so you can keep the automatic dog door closed at specific times. The SureFlap system operates on 4 C-sized batteries which should last about a year of normal use. At least, it won’t add to your electric bill. The downside is that it won’t fit your large breed dog. Also, it will keep un-microchipped and unrecognized dogs from gaining entry but will not prevent those already inside your house from getting out. Moreover, you’d have to have your doggie microchip-implanted by a vet. Picking an electronic dog door is actually easy. You will only need to determine the type of sensor mechanism you would like to work with, consider other factors, measure the correct size of the flap, and know how to install it correctly. Not to worry since we’re going to go into these in greater detail in this electronic dog door buying guide. How Do Electronic Doggie Doors Work? Electronic dog doors operate in almost the same way as your automatic garage door. It is essentially made up of at least 3 basic components: a sensor on the fixture, a sensor on your pet, and an opening and closing mechanism on the door itself. Technically, these types of dog access ways operate through the communication between the sensor on the fixture and the sensor on your dog, usually attached to its collar. When the sensor on the door receives a signal from the transmitter or ‘key’ on your doggie’s collar, this triggers a mechanism on the fixture to open the access way, allowing your pooch to either enter or exit through the passageway. There are different types of sensors currently employed. We will try to explore them briefly in the following. Microchip technology does away with collars. You don’t need to attach any other device onto your hound. As long as it has a vet-implanted microchip inside its body, this will serve as the transmitting or communicating device with the door. There are a lot of advantages to this system, mostly stemming from the absence of a collar. At the very least, you won’t have to worry about the device being lost since the ID microchip is embedded under your pet’s skin. It doesn’t need any batteries, too. The only power source you will need to supply is the mechanism on the door. There are two types of collar keys that operate on the principle of magnetism. The first type pulls a lever within the door itself. It works primarily on the force of the magnet, hence, it doesn’t require any batteries or power source at all. The second type features a mechanism in the door that ‘senses’ the magnetic field created by the magnetic collar key. Since it is actually a sensor, it requires batteries to run. One of the downside to such a system is that it never distinguishes pets. So, if your neighbor happens to have a magnetic collar, then it will be able to gain entry into your home, too. Additionally, magnetic attraction only works if the two systems are close enough to each other. This is one of the newest technologies in use. Key tags that use radio frequency identification (RFID) senses the presence of RFID-embedded devices within a particular electromagnetic field. The tags contain information that has been electronically stored. If the electronic information matches the one programmed on the automatic door’s RFID reader, then the access is activated. It is one of the most preferred methods of granting access to pooches since only those that have the correct RFID information will be allowed access. These don’t require batteries to operate, too. These keys use high frequency sound to communicate with the sensor on the door mechanism. The beauty of this technology is that you can easily adjust the sensitivity of the settings. Highly sensitive devices can pick up the ultrasonic signals from a few feet whereas setting it to the lowest possible settings will require substantially shorter distance between the key and the door. These typically come in waterproof versions although all of them will require batteries to operate. In some cases, the unit can be quite bulky and heavy, too. We can always look at radio frequency chip keys like RFID except that there is no embedded doggie information in the device. It is just plain old radio frequency. A device on the door picks up the radio frequency signal emitted by the key on the dog. This activates and opens the mechanism. Once the key is out of range, then the mechanism closes the door again. The downside should be fairly obvious. If another dog happens to wear a collar that emits at the same radio frequency range as the one on the door, then it will also be able to gain entry. Additionally, these can be quite large and will require batteries to run. Let us recap how an electronic dog door operates. A sensor on the door detects the signal coming from the dog. This can be in the form of the embedded microchip, an ultrasonic wave, a radio frequency, an RFID signature, or even the magnetic field or force created by the key on the dog. This activates an opening mechanism on the door and your pooch already has access. Now that you have an idea as to how such systems work, you can now start picking on the best possible electronic dog door for your home. However, the type of the sensing device used in the technology should not be your only consideration as there are quite a few things you will have to keep in mind as well. One of the most important factors requiring your attention is the size of your pooch. For instance, while the SureFlap is an excellent system overall, you simply cannot fit a hulking Great Dane or Saint Bernard or even a Labrador Retriever through its small opening. That is why it is imperative that you focus on measuring your doggie first so that you will have a more appropriately sized opening of the doggie passageway. Ideally, the height of the ‘hole’ or the tunnel should be at least 2 inches higher than the level of your dog’s shoulders. Now, if you have multiple pets at home, then take the measurement of your tallest pooch. Don’t mind the head as doggies will typically duck to push through. As for the width, adding 2 inches to your dog’s width at the shoulder or even at the hips should be enough. Again, take into consideration your pooch’s tendency to become obese. Additionally, if you have a puppy and you already want to install a pet passageway for it, you might want to check the maximum size of the adult of your puppy’s breed. This is to accommodate the growth of your pooch. We already discussed this in the previous section. If your pooch already has a microchip embedded under its skin, then a microchip-enabled system should be your first choice. If not, an RFID mechanism looks especially tempting, although ultrasonic and magnetic works as well. Do understand that magnetic systems don’t necessarily differentiate between dogs so even your neighbor’s pooch may venture inside. If you want to go cheap, radio frequency-operating mechanisms can be viable options. The door or through the wall? 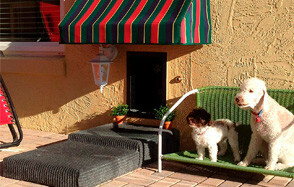 Doggie accessways come in 2 different designs: wall- and door- installation. Door-installed systems are a lot easier to accomplish and will typically not require any additional tunnel extensions. On the other hand, wall-installed systems may require substantial effort in its installation especially if your wall happens to be thick and made of concrete. It’s actually more of a personal choice that reflects your idea of where you would want to conceal your doggie access. You’ll have to choose between plastic and metal frame. If you’ve got a small breed of dog or even a toy pooch, then maybe a plastic frame will suffice. However, if you’ve got a pooch that is well-known for breaking up things or one that is quite on the heavy side, then opting for an aluminum frame is best. Creating a hole either in your door or through your wall simply means a substantial change in the energy efficiency of your home. Warm air from the outside can enter your home, heat up the interior, and increase your energy expenditure since your air conditioning system will have to be revved up a bit to make your home interior cool again. Likewise, in winter or in especially cold days, cold air from the outside can move inside your home, lowering the room temperature. You will have no recourse but to increase the intensity of your heating system to keep your home interior warm and cozy. Either way you will still be spending more energy than necessary. That is why it is important to look at the overall construction of the doggie door. It should be well-protected from the elements and achieves a perfect seal on the frame to prevent cold or warm outside air from entering your home. Some experts say that extending the length of the tube can also work, albeit at the expense of aesthetics. It’s like putting a transitional space between the outside and the inside of your home. 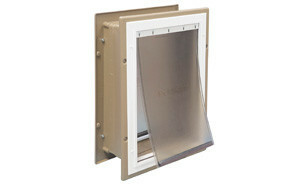 When the dog enters through the exterior panel, the interior panel is not open yet. As your dog pushes through the interior panel, the exterior flaps would already be closed, minimizing the movement of either cold or warm air. Of course, you’d need a tube that is of the same length as your dog which ultimately makes it quite unacceptable, aesthetics-wise. This is one feature that you will never see in the more traditional canine passageways. Automatic dog doors allow you to program how the door will open and close. Some have unique sensors that activate the system only if the correct RFID signature, radio frequency, ultrasonic signature, or embedded microchip is recognized. Otherwise, they won’t open at all. Moreover, there are those that only activate certain direction of movement such as selective entry but with freedom of exit or vice versa. There are also timed mechanisms, allowing the door to stay open but only for a predetermined length of time. We already mentioned that one of the most crucial factors you will need to consider is the size of your pooch. This is because it will dictate the size of the pet door. Here’s how to take the measurement of your pooch. Height – Let your pooch stand and measure its height from the surface of the floor right about to the level of the highest protruding section of its back. Add 1 to 2 inches to this measurement. Width – Let your pooch stand and measure its width at the broadest part of its body, usually around the torso or perhaps even in the hind legs. Make sure to take into account your pooch’s predisposition to become obese. Again, add 1 to 2 inches to this measurement. For example, if your pooch stands 18 inches and is about 8 inches broad, then the size of the doggie door should be about 9 to 10 inches wide and 19 to 20 inches high. Now, do understand that this is only for the flap size or the actual opening of the doggie passageway. To create the correct size of hole in your wall or door, you will have to measure the dimensions of the frame upon which the flap is attached. You will also need to consider the step over height if the design you chose came with a rise. Ideally, puppies and elderly hounds require low step-over height, usually 1 to 2 inches. However, for bigger or larger dogs, 5 to 10 inches are the usual recommendations. To say that doggie doors are nothing more than simple passageways for our pets is an understatement. These fixtures, as simple as they may be, can come with a variety of benefits. Here are some of them. Even if you have trained your pooch to defecate and urinate only at certain times of the day, it is inadvertent that when they feel like going, they’d have to. Unfortunately, if you’re out at work, then that means your pooch will have to ‘hold’ it off until you come home. If you’ve ever tried controlling your pee and feeling very relieved as soon as you were able to release it, then that’s exactly what you are giving your pooch. You’re giving it the opportunity to relieve itself whenever it needs to. In addition to relieving itself, access through the door means more playtime and exercise for your pooch. It can go exploring your backyard or garden. Even if you are already home, they would still want to run, jump, and feel as free as they can. Many canine behavioral problems arise from boredom. Pooches don’t have anyone to play with inside the home. Giving them access to the outside world helps combat boredom and also enhances their socialization activities with other dogs. This can also lead to healthier mental stimulation for your pooch. You’re not the doorman to your pooch. You don’t need to get up from what you’re doing only to open and close the door for your hound. You can also continue your sleep without your hound jumping on you, begging on you to go open the door so it can go relieve itself. Dogs have a way for telling their masters they want to go out. Many scratch on the door. By giving them access to the outdoors, they won’t have to scratch your fixture anymore. Installing a pet door is quite easy. You don’t even need a professional to do it. All you need are the correct tools and materials and a basic understanding of what needs to be done and you should do just fine. Assemble all of your tools and materials ready. This means you should already have bought the best doggie door for your pooch. Most products come with a cutting template. Use this to outline the doggie door onto your door or wall. Using the correct cutting tool depending on the material of your door or wall, cut a hole through the substrate and follow the outline of the cutting template. If you’re working on a door, it is usually best to remove the door from its hinges so you’ll be more efficient in your work. Before securing the doggie door frame through the hole, check its fit first. If it doesn’t fit, then carefully trim the opening. Secure the frame using the screws that came with the package. Make sure not to overtighten the screws. You may also want to apply caulk where the frame meets the wall or door to help prevent air from leaking. Once installed, train your pooch on how to use the doggie door. Don’t expect it to learn right away. A combination of patience, perseverance, lots of praises, and ample treats should do the trick. A good automatic dog door is one that will help your hound feel a lot more comfortable about going in and out of its home. With these best electronic dog doors, you’re a step closer to providing them such comfort and convenience for yourself.